This set of four clean lined display easels is available in three different sizes to accommodate items from 5" all the way up to 15". 8" size measures 8" H x 5" W x 3.75" D with a 2.75" bracket depth. Perfect for items 5" - 9". 10" size measures 10" H x 6" W x 4" D with a 3" bracket depth. Perfect for items 8 - 12". 12" size measures 12" H x 7.75" W x 4.5" D with a 3.5" bracket depth. Ideal for items 9" - 15". 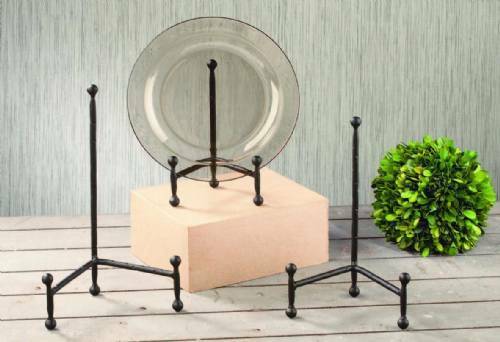 This simple and elegant decorative easel showcases plates, platters, pictures, books, artwork and more without distracting from the beauty of your display item.